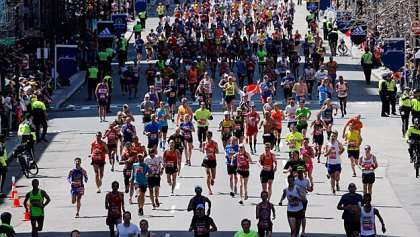 The 2015 Boston Marathon is 2 weeks away, hopefully your marathon training has been going well, you’re injury free and anxious to get to race day. This post will provide details of one of the most important runs of your entire marathon training program. I also outline other workouts for the last week of Boston Marathon training leading up to your taper. 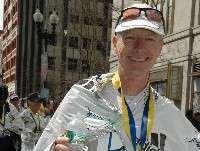 I completed the 2013 and 2014 Boston Marathons. In each of these last 2 years, two Sunday’s before the big race, I have run a timed half marathon. In fact, I use this strategy before all my marathons. Running this half marathon at marathon pace gives my body a simulation of the race day experience. I have a course near my house that includes some rolling hills. It’s perfect because it simulates some of the terrain on the Boston Marathon course. This is the longest run I complete over the last 2 weeks of marathon training. The workout gives you a good idea of how you will perform on Marathon race day. I start the run with a warm-up (easy jog) for a ½ mile and then I run at marathon race pace for a half marathon. Timing this run is optional. I time all of my runs, but what’s most important is that you simulate as best as possible the pace and your marathon race day drinking and gel consumption. Ideally you should have a meal the night before that is the same as what you’ll eat the night before the Boston Marathon. Although not necessary, it would be perfect to run near the same time as you will on race day. Hopefully you feel strong and easily complete the workout. If so, great, you’re nearly ready for race day. However, if you don’t feel your best during the run, don’t worry. You’ll be starting your taper shortly and oftentimes the 7-10+ day of slowing down is all that’s needed to freshen up your legs. For the last hard workout before the Marathon I recommend one more tempo run on the Sunday 8 days before the Boston Marathon. Start with 1 mile warm-up and then run 6 miles at marathon pace. Finish with 1-2 miles recovery for total of 8-9 miles. Pick a course with some rolling hills if you can. The goal is to stretch out and push yourself at a comfortable pace one last time. After this run, ensure you thoroughly stretch and eat a recovery meal that includes a balance of carbs and protein. During the last week of marathon training, you should taper. This will include some days of 3-5 miles at an easy pace and one day of very light intervals (100-200 meter strides). Good luck on race day. You’ve trained hard, now enjoy the day.